Bonus video poker is a poker-type game with the same hand rankings. It has a lot of variations and can be played with 1, or 3, or 5, or 10 hands at the same time. Choose the type of the game and number of hands (from menu). 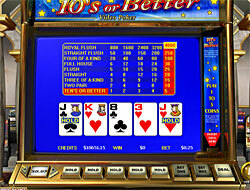 Choose the value of the coins offers, which are available in particular video poker machine. After you've made all your choices select "Deal". 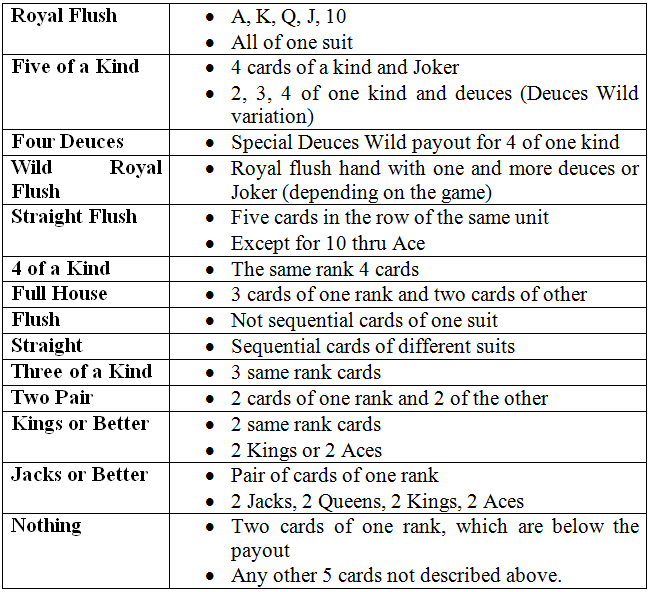 The gamer is played with regular 52-cards deck (only Joker Poker is played with 53 cards deck, which includes Joker) and the players are dealt 5 cards. Select the cards you want to keep by the "Hold" button. It is possible to discard all the cards. If you are satisfied with your result push the "Draw" button. Each hand of cards deals from various decks in random order. After the end of the round the hand values are paid. Clear Bet - clear bet amount. Draw - change unprofitable cards.